Our resource centre in WGC. Herts Vision Loss is a county-wide organisation which provides help and support for visually impaired people and their carers. This is achieved through a number of front line services including: social groups and activities; home visiting and befriending service; support in local hospital eye clinics; demonstration of specialist equipment; together with the provision of information and advice. The purpose of our charity is to increase independence and reduce social isolation in the community. Our outreach service helps alleviate feelings of loneliness and isolation for people with sight loss whilst increasing social networks and independence with daily living tasks. 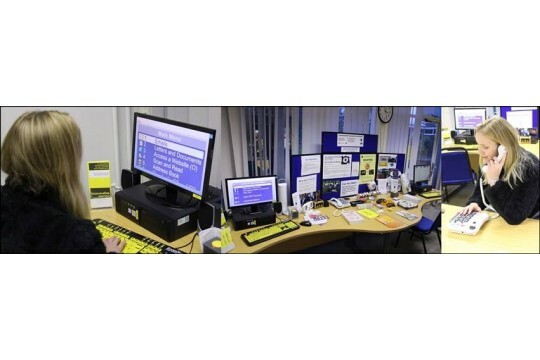 We support anybody with sight loss, we have a resource centre with visual aids and IT in WGC. We can visit people at home if they are unable to get to us. We offer community advocacy to support people in accessing the services they are entitled to. We also offer a counselling service for those experiencing sight loss. The numbers of people experiencing sight loss is rising, and therefore so is demand for our free services. The majority of our funding comes from donors rather than local authority funding streams. In 2015 we achieved 1,800 client consultations, via telephone or home visits. Our befriending volunteers made over 1,650 visits giving about 3,600 hours of comfort, help and support over the year. Providing an effective service is so much more than a quick 'hello' - it's a relationship. Herts Vision Loss is always looking for new volunteers: to befriend a visually impaired person and help deliver our free services to Hertfordshire residents. pays for one Sight Information Point service. Would help fund our Sight News magazine, sent to all our service users.